Sweet Peppers Stuffed with Cheesy Spinach Dip are the perfect appetizer to serve at a party. 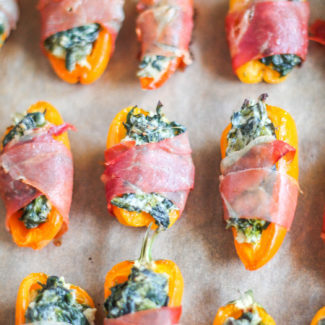 Sweet peppers are filled with a simple cheesy spinach dip, wrapped with prosciutto, and baked. This is an easy recipe that your friends will love! Heat your oven to 350 degrees, and then start preparing the sweet peppers. Slice the peppers in half and remove the seeds. Set aside. Heat the butter in a skillet over medium heat. Use a garlic press to crush the garlic, and then saute it in the oil for 1 minute. Then add the spinach. Saute until hot, about 3 minutes. Add the basil, salt, pepper, yogurt, cream cheese, and Parmesan. Stir until the cheese has melted. Next, fill the peppers with the spinach dip. Cut each slice of prosciutto lengthwise into three thin strips. Wrap each spinach dip stuffed pepper with a strip of prosciutto. Place the sweet peppers on a parchment-lined baking sheet and let them bake for 25 minutes. Serve warm.